The Platinum Tools 100055C PROAMP Crimp Tool (Clamshell Pack) is designed for installing AMP-style modular plugs. This heavy-duty crimp tool provides reliable and repeatable terminations every time, and is the perfect solution when working with high performance OD cables that are tougher to terminate because of large wire gauges, thicker and harder insulation, and pair separating splines. 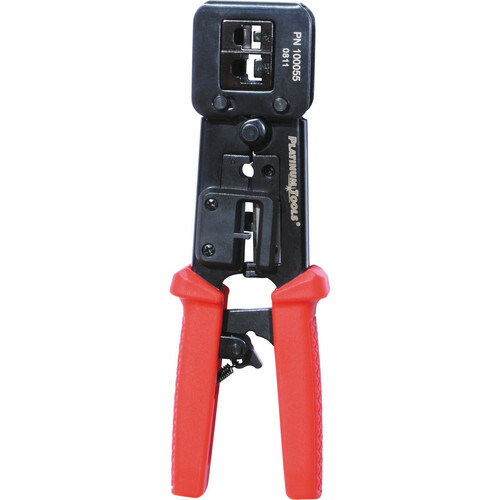 You can overcome these connectivity obstacles with this PROAMP crimp tool and be assured that every termination will meet FCC specifications. Box Dimensions (LxWxH) 11.6 x 4.7 x 1.0"